Had quick run out this afternoon finding two first-winter male Common Mergansers at Tri-town beach in Whately, some 120 American Pipits in Old Deerfield, and a beautiful family party of Pale-bellied Brant (Branta bernicla hrota) at the Turner's Falls power canal. I might have missed them as I was busy going through the Canada Geese on the water. This family was grazing on the far embank by the bike path on the East side of the power canal. I didn't hesitate and walked around to get amazing views. I must say they were ridiculously tame. 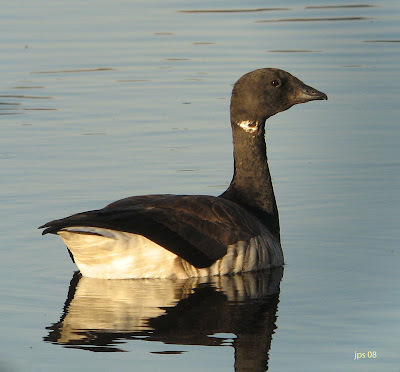 I've had one or two flocks of Brant pass through the Connecticut River valley in most recent years in October. They usually go through fast and high, so getting this close to a family group was a real treat. Red-eyed Vireo - N. Whitney Street in late October. 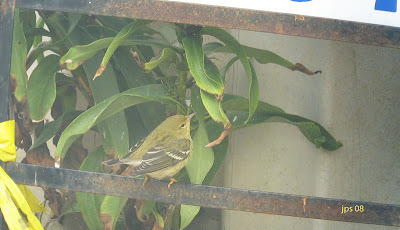 This vireo suddenly appeared in the trees behind our rear balcony in the middle of the afternoon. It was a Red-eyed with a fairly nasty growth on its left cheek which in this shot appears a bit like an orange cheek patch. 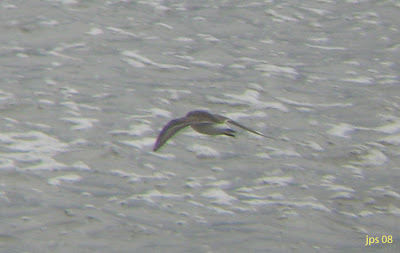 After a bit of a scramble for bins and camera, I just got this one very poor record shot taken through Leica 8 x 32 bins. 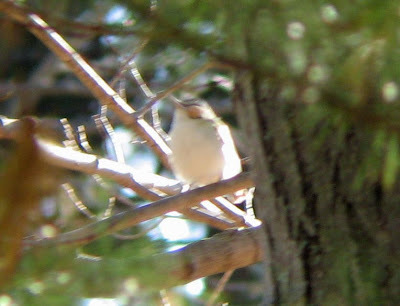 I've Blue-headed Vireo as late as this, but this maybe my latest Red-eyed in MA? 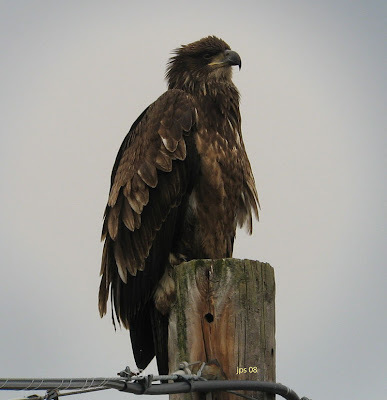 Bald Eagle - juvenile, Barton Cove, Turner's Falls. 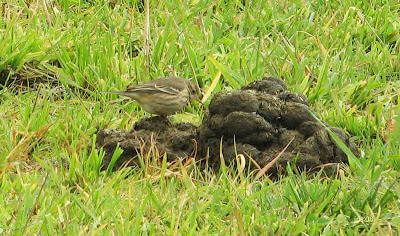 American Pipit - Hatfield, over 100 today. 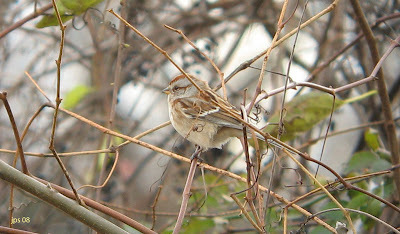 American Tree Sparrow - Hatfield. Bufflehead - Turner's Falls Power Canal. Tough day, well relatively tough. Most of today's best birds were either too distant or too skittish to entertain thoughts of digiscoping, and a strong, raw Westerly wind probably didn't help. I spent much of the day working sites along the Connecticut River between Hatfield and Gill. 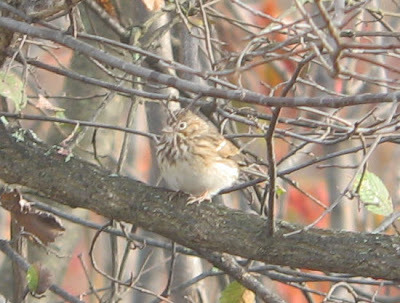 Birds were fewer in volume than in recent visits to Hatfield with a notable drop in sparrow numbers, perhaps with the possible exception of Song Sparrow. Geese were hard to come by, or at least settled geese that I could scan through. Hunters have been about this week and geese have become increasingly skittish. The first snow flurries, American Tree Sparrows and Buffleheads of the fall all appeared today! 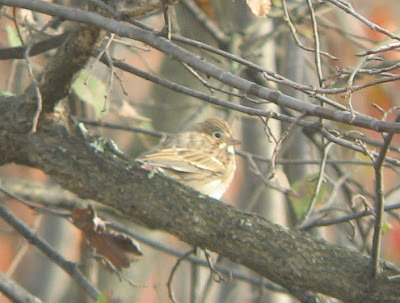 Notables included c.160 Brant moving south at speed well West of Hatfield, 2 Wilson's Snipe, 98 Horned Larks moving south in three flocks, 105 American Pipits on rough pasture at Hatfield, 3 American Tree Sparrows, Vesper and Grasshopper Sparrows at Hatfield, 3 drake Bufflehead at Turner's Falls and an incredibly naive Bald Eagle at Barton Cove. 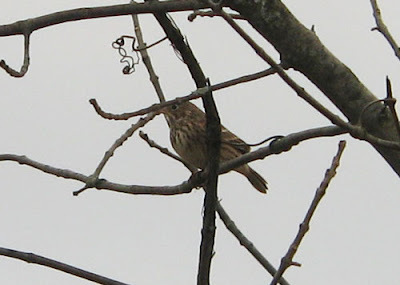 Also, a noteworthy migration of about 700 American Robins and 60 Pine Siskins over Hatfield as well. Images - Just a reminder that all of the images on this blog can be enlarged by a single click on each picture. 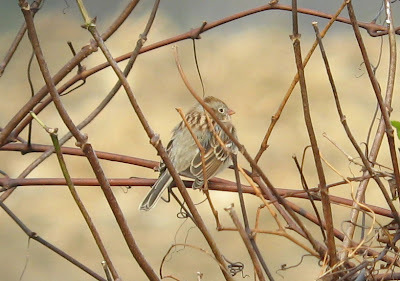 Field Sparrow - one of three at Hatfield. White-crowned Sparrows - About nine at Hatfield today. 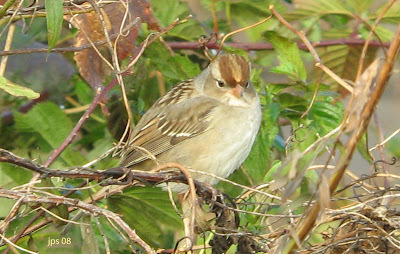 Vesper Sparrows - an impressive seven birds at Hatfield. 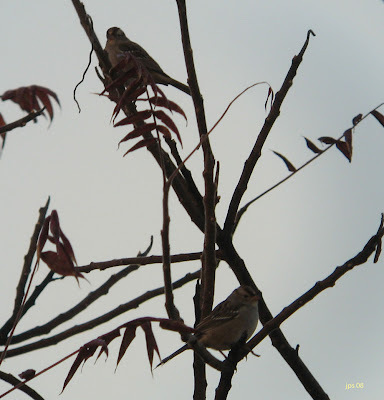 'Red' Fox Sparrows - First of season with about 3 present. 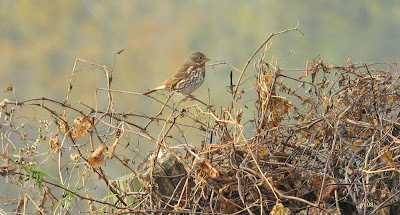 The first Fox Sparrows of the fall appeared this morning with about 3 birds along the hedgerows near Great Pond. Actually, it ended up being an excellent morning for sparrows in general with about 9 White-crowned, 7 Vesper and 3 Field Sparrows. 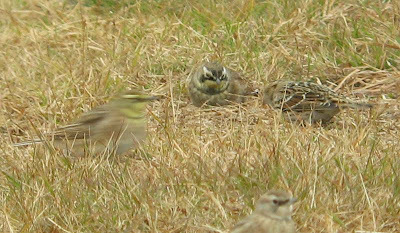 Still hundreds of Savannahs, Swamp, Song and White-throated Sparrows around with slightly fewer Chipping Sparrows. Also, well over thirty Northern Cardinals. Other birds of note today, in addition to the Cackling Goose, an adult tundrius Peregrine, Northern Harrier, 25+ American Pipits, 5+ Snow Buntings, 20 Eastern Bluebirds, 600 American Robins and about 1,000 Red-winged Blackbirds. Warblers definitely thinning out with only Yellow-rumped seen this morning, not that I was working especially hard for them. No shorebirds of any kind noted, but otherwise a very productive morning. Cackling Goose - Hatfield, Oct 27th. 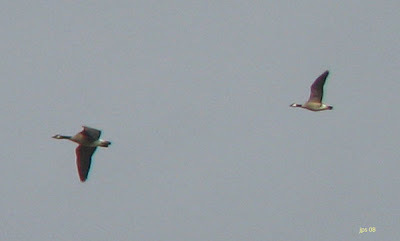 Presumed 'Richardson's Cackling Goose - In each image the Cackling Goose is second from the left. 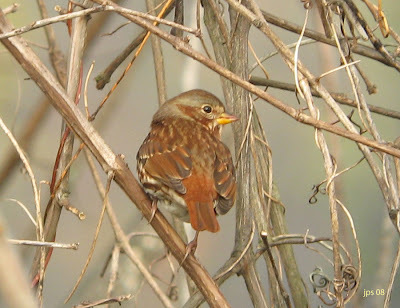 Useful pointers include the tiny size, rather pale breast and underparts, plus more importantly, the eye catching broad white-cheek patch and short black neck sock. Another busy morning in Hatfield. Lots of activity, especially amongst sparrows, but I think the highlight would have to be this flyover 'Richardson's' Cackling Goose heading South with just six Canada Geese at 09:38 am. Strikingly small and identifiable as a Cackler with the naked eye, thus allowing me to get the camera ready for digibin shots before it had gone through. Luckily, this was the closest group of geese that I'd had all morning with 250-300 Canada Geese moving South-west from sunrise onwards, but none of them especially close. Some of these settled to feed somewhere West of Hatfield though I didn't chase them down. 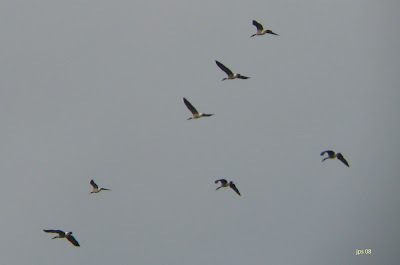 The group containing the Cackler however, headed due South showing no interest in feeding and behaved as if in migration. We shall see what the next few days bring. All in all, very cool to see this one flying over recalling this flyover from nearby Hadley in Nov 2006. 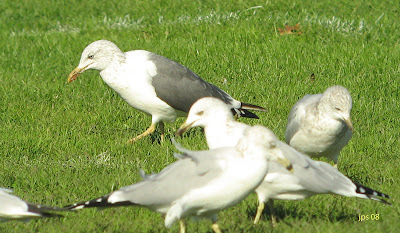 Lesser Black-backed Gull - adult graellsii with Ring-billed Gulls. A glorious day by any standards. Warm, almost balmy with temperatures in the mid sixties and a gentle South-westerly breeze, quite a contrast to the torrential rain and South-east gales that hit us overnight. 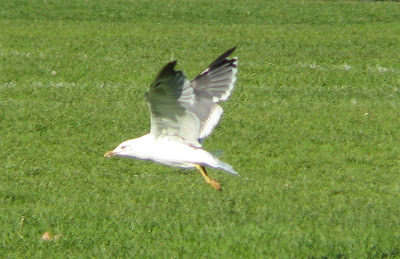 Came across the first interesting large gulls of the autumn with an early first-cycle Kumlien's Iceland Gull over the Umass Amherst playing fields in late morning (around 10:50am) and an adult Lesser Black-backed Gull with up to 500 Ring-billed Gulls on Umass playing fields in late afternoon. The latter was also noted independently by Brian Kane in the afternoon. 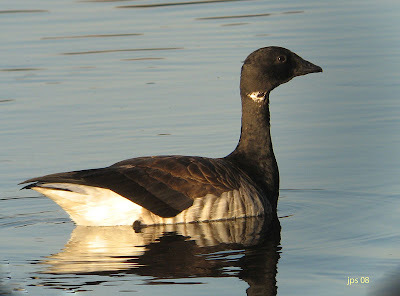 About 400 Canada Geese were on the Umass campus pond, but alas no Greater White-fronted nor any Cackling Geese present. 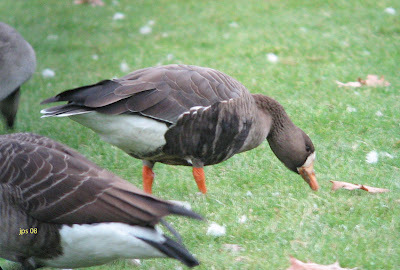 White-fronted Goose - Amherst, Oct 25th. 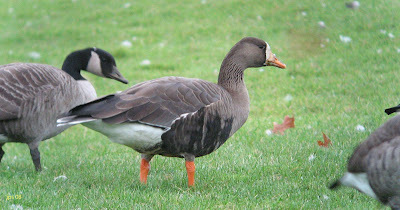 Hopefully this Greater White-fronted Goose on the Umass-Amherst Campus pond will mark a change of fortune in our local goose watching this fall. 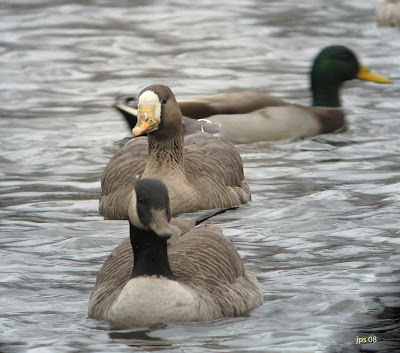 Despite numerous checks of this site and the power canal at Turner's Falls, the scarcer geese have been decidedly thin with no definitive Cackling Geese to date. 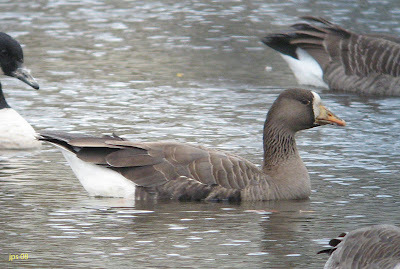 This White-front turned up in late afternoon and wasn't present during my first pass of the campus pond around 1:30 pm. 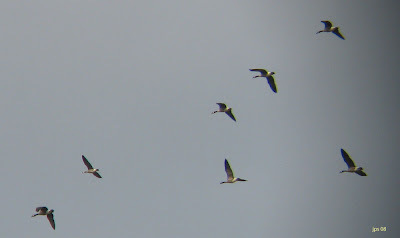 Other birds included about 300 Canada Geese and a single Common Yellowthroat. Cassiar's Junco?? - Oct 22nd. 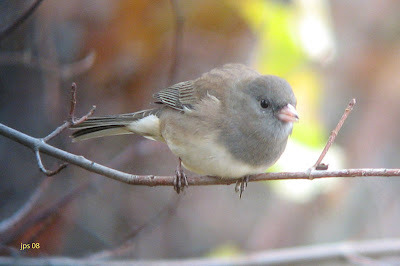 Dark-eyed Junco - first winter, possibly showing mixed characteristics of 'Slate-colored' and 'Oregon' Juncos. 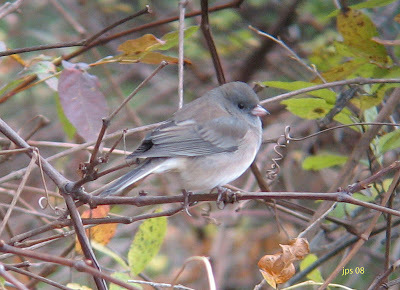 Came across this interesting and fairly obviously 'hooded' first-winter junco at the Blueberry Patch, Quabbin Park. 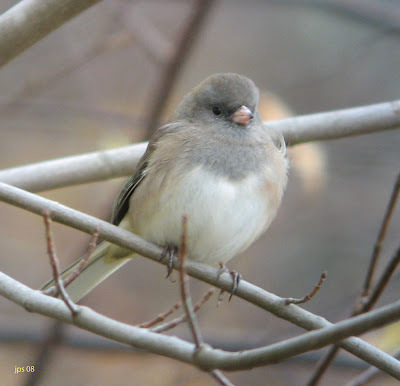 It was feeding by the roadside with a handful of Slate-colored Juncos but was relatively easy to pick out especially when perched (rather than ground feeding) due to the shape of the 'bib'. However, the grayish hood was not cleanly demarcated from the buff upper flanks as one might expect in a neatly marked 'Oregon' Junco which has since had me wondering about the possibilities of a Cassiar's Junco - an intergrade population between Slate-colored and Oregon Juncos breeding in the Canadian Rockies. 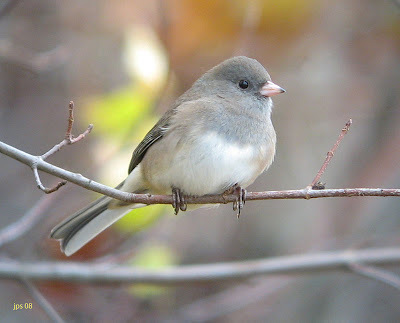 A very interesting discussion, opened up by Mark Szantyr on this and various other forms of Dark-eyed Junco can be seen here on the Oceanwanderers website. 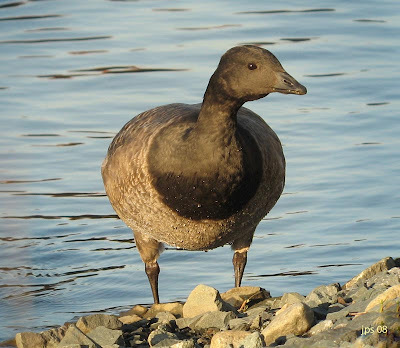 This bird at the Quabbin shows a resemblance to some of the birds discussed here. 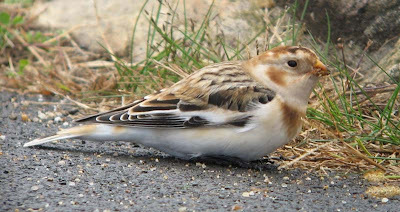 Lapland Longspur - Extreme right bird in all three images. 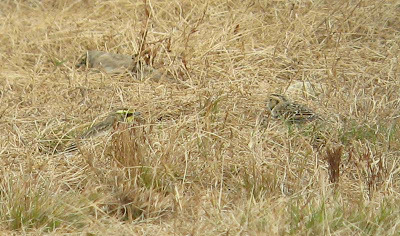 This flock also contained at least two very interesting Horned Larks, both with pure white supercilium and heavily striated breast. 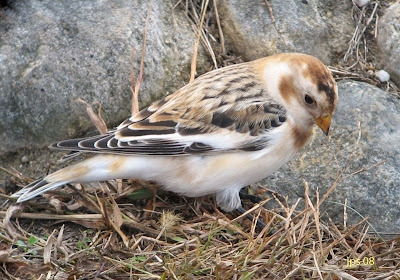 The last couple of days have brought a small rush of local Lapland Longspurs . 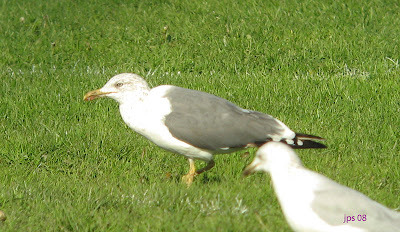 Yesterday (Oct 21st), one circled fields for about five minutes near Great Pond, Hatfield without landing and later moved off South-east. Today, a single moved South over Winsor Dam Quabbin Park at 07:52 am and I discovered two birds in a small flock of Horned Larks at Orange Airfield at the same spot as last year's Northern Wheatear. Had it not been for a nice male Northern Harrier flushing birds off the airfield, I doubt if I would have gotten close to the larks and longspurs. 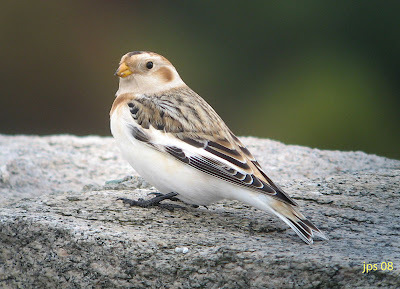 Perhaps appropriate for today's icy blast from the North, my first local Snow Bunting of the fall feeding on the dam wall at Winsor Dam, Quabbin Park. A fly-over Lapland Longspur didn't bother joining him and flew straight on south. 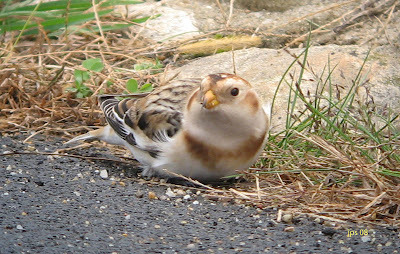 My first Snow Bunting of the autumn in 2006 was in exactly the same spot on October 26th! White-rumped Sandpiper - molting juvenile, Avalon, Cape May. Hand held digibin shots using Canon Powersot A560 through Leica 8 x 42 binoculars. We got a rather late start this morning but decided to try for Hidden Valley, part of Higbee Beach WMA. 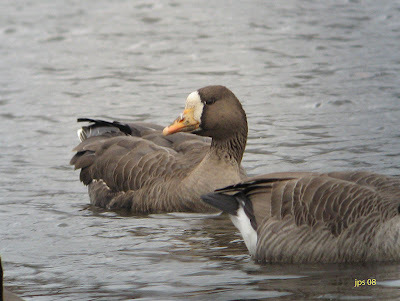 It was clearly much colder than the previous days with a strong North-eastern wind making birdfinding difficult. We had a few birds of interest (Wood Duck, Eastern Meadowlark, several Blackpoll Warblers and White-crowned Sparrows) but gave up in the conditions and headed north to the Avalon seawatch. 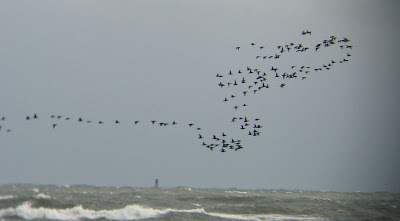 Black and Surf Scoters migrating south at Avalon, Cape May - thousands poured southwards all day. The decision was a wise one. When we arrived the seawatch point was well represented with birders and stream upon stream of dark-winged scoters (all Black and Surf) poured past. 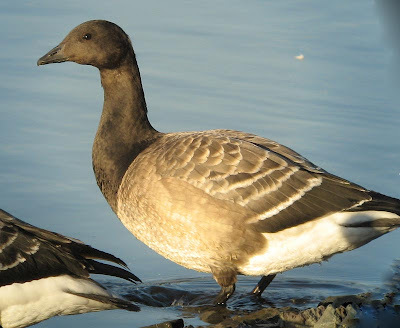 Outside of the scoters, variety was rather limited with a handful of Northern Gannets plus a few dabbling ducks, mostly Green-winged Teal and Northern Pintail, passing with the scoters along with a single Greater Scaup. 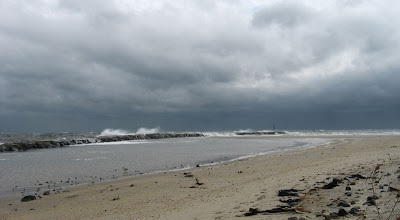 After an hour, I had a walk along the seawall with Matan and a found nice flock of shorebirds sheltering from the wind. 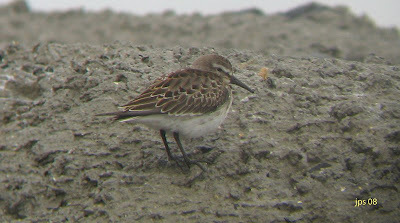 The flock included a few Western and Semi-palmated Sandpipers and a single juvenile White-rumped Sandpiper. Just before we left an exhausted Blackpoll Warbler turned up in a tiny group of pines by the seawatch station with a Brown Creeper in the same pines just a few minutes later to add a touch of the bizarre! Blackpoll Warbler - exhausted migrant next to the Seawatch point at Avalon. Later I returned to the Avalon seawatch to find an even bigger group of birders, and the scoter migration continuing unabated. The migration included slightly more variety later in the afternoon with Common and Red-throated Loons, Brants and several large mixed flocks of Great and Snowy Egrets passing high overhead. 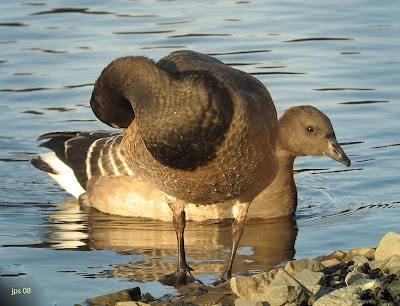 The day ended on a high when a sub-adult male King Eider flew past alone just before 6pm. 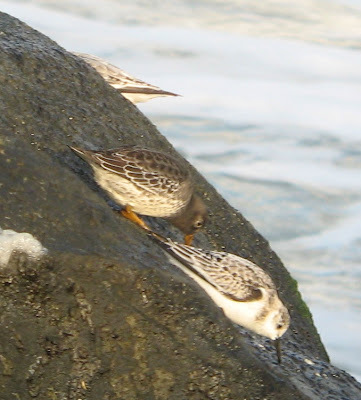 What was almost certainly the same bird was found off Cape May the very next day and featured in this post on Cape May Bird Observatory's website. 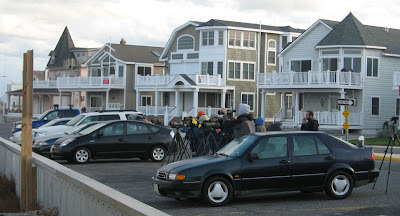 Birders gathered at the Avalon Seawatch, Cape May. Today's scoter migration really was a spectacle which we felt privileged to witness. Although I haven't see the official totals from the day, I would guess that something in the region of 80,000 dark-winged Scoters passed the Avalon seawatch on October 18th. Purple Sandpiper - on the jetty in front of the Seawatch point, Avalon, Cape May.